Thomas Baxter must have stood in present-day Dynevor Place (then known as Washing Lake Lane) to capture this view of the Willows and Mount Pleasant. The panoramic sweep includes the homes of some of Swansea’s most influential citizens. To the left of centre stands the Willows, recognizable by its large Georgian bow window. This was the home of Lewis Weston Dillwyn, owner of the Cambrian Pottery, and who until September 1817 employed Thomas Baxter. Just behind it, to the right, is Windsor Lodge, which is still standing. The group of houses on the right stand on the site of the new Central Police Station and include The Laurels, home of the Grove family, William Robert Grove was a founding member of the Royal Institution of South Wales. The darker house above these to the right is Mount Pleasant, with its red brick frontage. Above this, to its left are two semi-detached mansions. Higher again stands Bellevue, near the spot chosen for the Grammar School, which although originally established in 1682, was refounded with new buildings being built on Mount Pleasant between 1851-53. 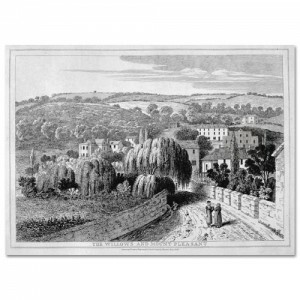 It is interesting to compare this view with one engraved by Thomas Rothwell in 1791 when only around half the houses depicted by Baxter had been built. In the foreground two women exchange pleasantries while a third draws water from a stream at the roadside. Swansea’s inhabitants were still dependent on streams such as these even after the first piped supplies appeared after 1837.